The Cleveland, Ohio based Wolves at the Gate are back for their second full length in VxV and while their melodic stylings are still on display the band has begun taking a much harder approach on this album. From start to finish, musically they seem to have adopted a much darker tone. When first listening, the album opens with a few spoken lines that attempt to convey the ideas behind the rest of the album. Shortly after, VxV drops into familiar heavy riffs with some catchy melodies. The first half or so of the album carries itself well, changing up their sound and showing some solid growth for such a fresh band. The second half of the album feels and sounds disconnected from the first half. Simply put it is much slower and softer. While a ballad or two usually is not a bad thing VxV begins to feel like less of a cohesive piece and more of random songs thrown together. That said the album rounds out well however. 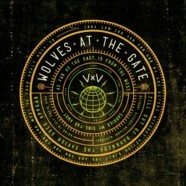 Overall I believe with a few more albums under their belts Wolves at the Gate will continue to grow and surprise us. I look forward to their next body of work to see whether they sink or swim.